A complete dining table set from Abacus will take your breath away. 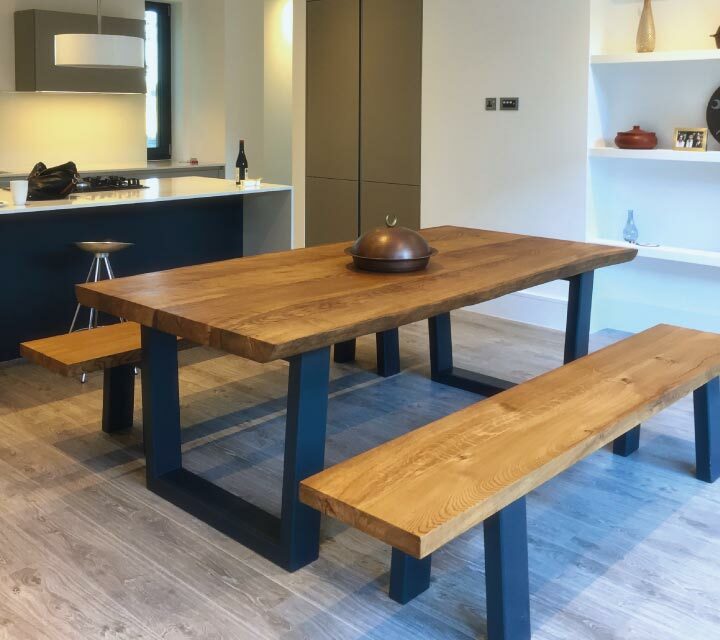 From our entire range of dining tables, choose the table that we will custom build to the perfect size for your space and then tailor the design to compliment the style of your home. Then, to match your perfect table, choose the style of your seating from any combination of chairs and benches and will be build them to match your table. 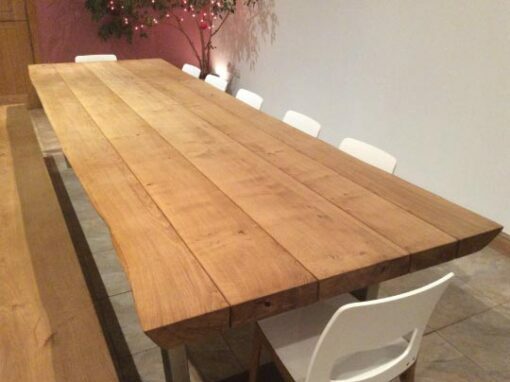 And because our tables and seating is built by hand from nature and man’s strongest and most beautiful materials, your dining table set will last forever. 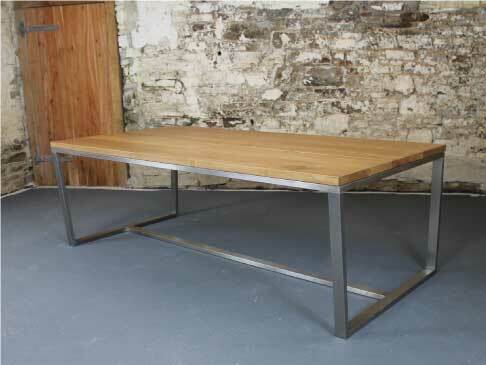 Every one of our dining tables is custom built to perfectly fit the size and style of your room. 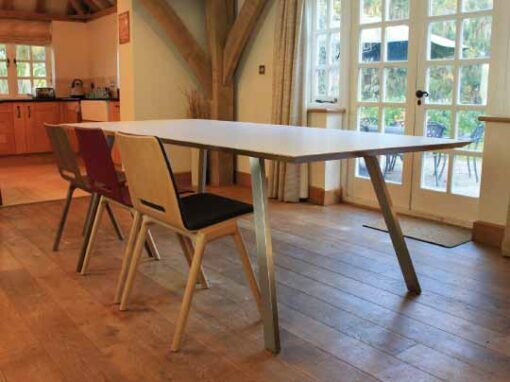 Choose from our complete range of dining tables, made from the most beautiful and durable materials for both oak dining table sets, or more modern dining table sets. 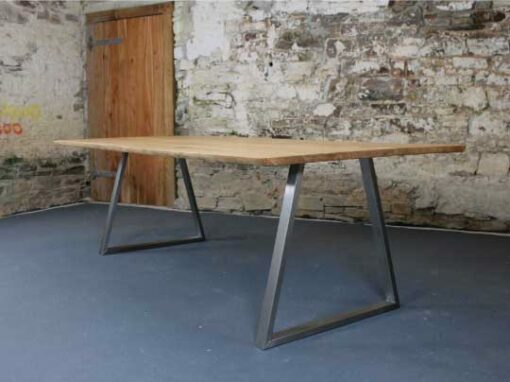 Our array of table designs are defined by their aesthetically engineered bases, made from beautiful thick oak or precision hand-welded in stainless steel to give you the ultimate lasting strength no matter how heavily a table is used. Once you’ve chosen your table design, customise your table top to compliment the style of your room. 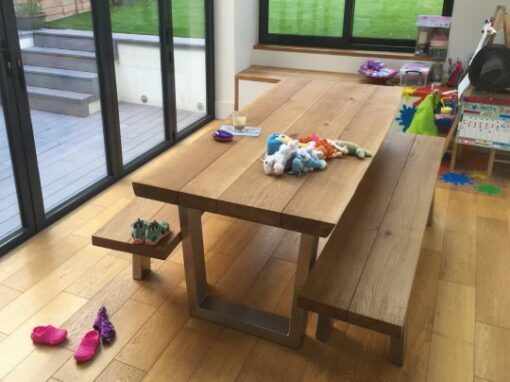 Our premium quality real French oak table tops are made from single pieces of oak from a single tree. Or our high-performance table tops are engineered for practicality with an advanced cleanable, durable and stain-resistant modern surface. 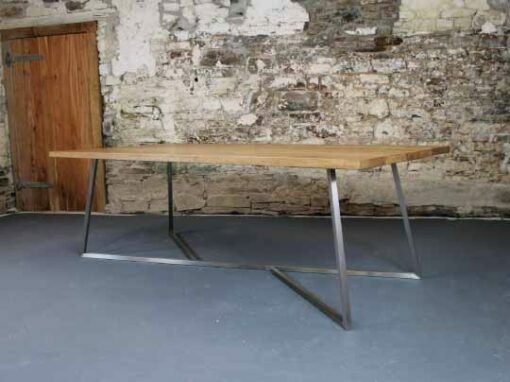 And our table tops come in a range of thicknesses, from very chunky table to sleek and slender, your table can be a stand-alone centre-piece or fit perfectly with the style of the other furniture in the room. Finally your choice of table edge will subtly define the unique style of your table. Choose from a traditional hand-finished square table edge, or a live natural table edge that follows the real curve of the outside of the tree, or our knife-edge design that cuts into the air with sharp contemporary style. 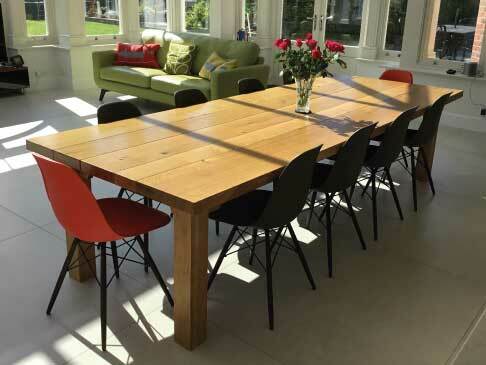 Our chairs and benches are built to order so that you will have the perfect matching dining set. 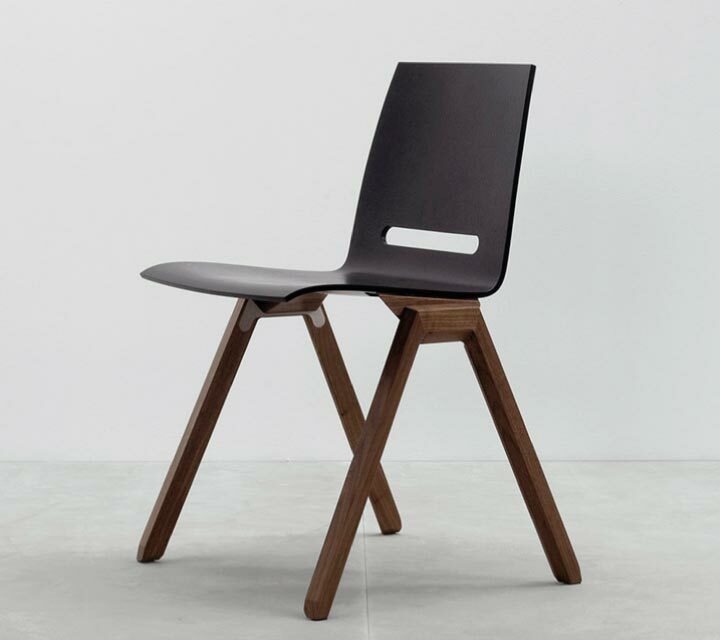 Choose one of our minimally design but extremely well made, comfortable oak chairs and customise exactly the way you want with a selection of quality leather or fabric seat and back cushions to choose from. 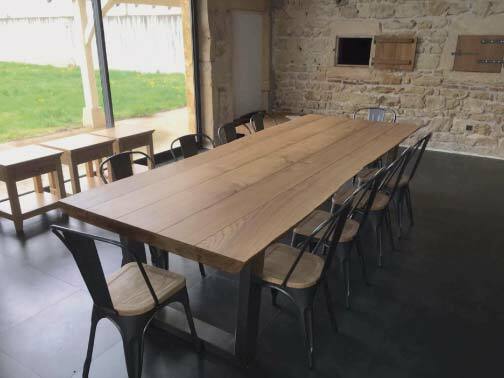 Or if you would like bench seating, each table has it’s own matching bench design that we will build to fit the size of your table and seating needs. 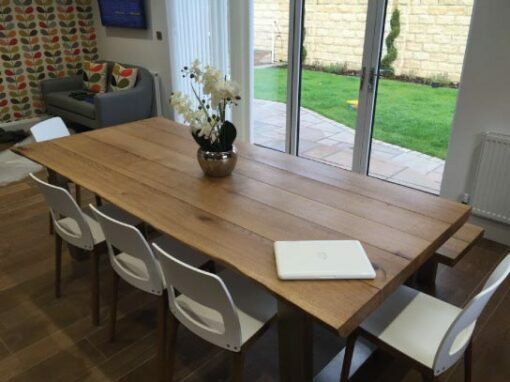 All of our tables and seating comes in a wide range of colours and natural oak tones to suit your home. 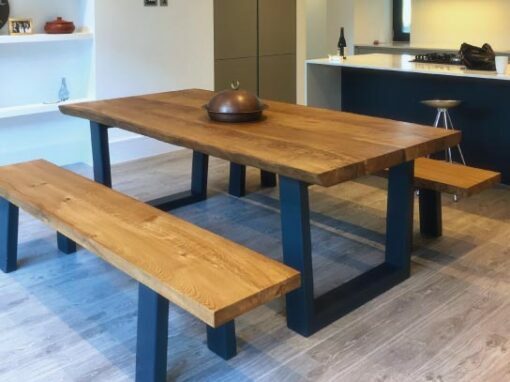 Our oak colour palette gives you a choice of 4 durable finishes, selected specifically to maintain the oak’s beautiful natural look and feel whilst being very user-friendly and requiring the minimum effort to maintain a fresh appearance of a wood dining table set. For our steel bases and high-performance table top surfaces, we have a palette of 12 colours to choose from in both matt and high gloss finishes, to give you the exact look and feel you want. And if you’re looking or a specific colour, we also have a bespoke colour option for our tables, chairs and benches to ensure the perfect fit for your room. 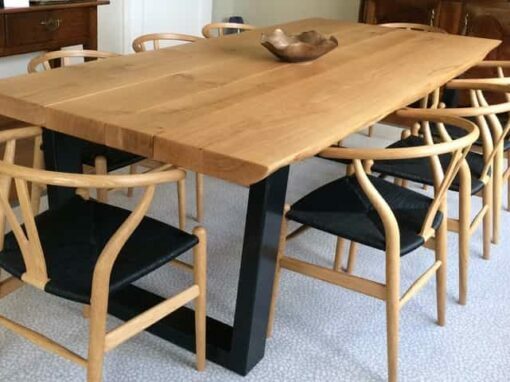 We know that the size and shape of a dining table and chair set are critical to get the perfect balance of maximum functionality and fitting a room perfectly. 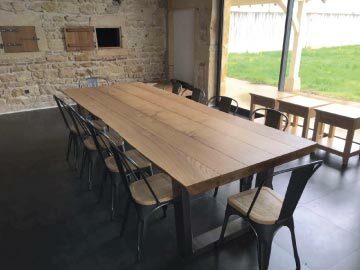 Our tables can be custom built in a huge range of sizes and shapes, whether you need a rectangular, square or round table for your space we have a choice of dining sets for you. 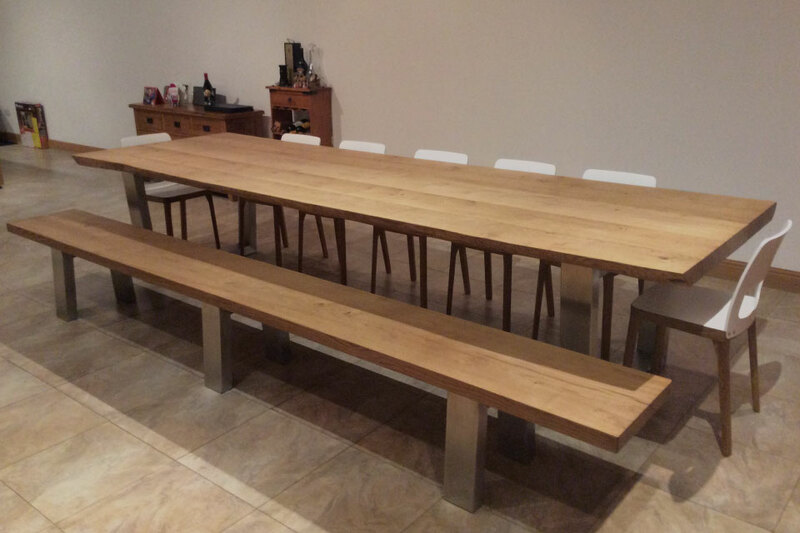 From a compact 2 seater corner dining table set, to a huge 16 seater banquet table, you can customise the table and seating design to give you a dining set that will far exceed your expectations.